If you asked a group of people to describe what they considered “clean,” you’d most likely receive a variety of different answers, some of them talking about minimalism and some of them mentioning straight lines, while others just talking about a lack of clutter. Clean WordPress themes are big business because these themes stray away from the designs you may have stumbled upon in the ’90s. Five years ago, themes were packed with flash animations and clunky media elements. Today, flat designs and plenty of white space tend to make a good WordPress theme or any website template. Does Clean Mean a Lack of Features? Absolutely not! In fact, many themes on this list come loaded with all the usual features like contact forms, sliders, galleries, and widgets. The difference is in the presentation of these elements. A clean theme incorporates a lot of white space and avoids clutter. The best themes carry this concept into the code as well, meaning faster load times. We’ve spent a good amount of time researching these themes to ensure their quality. We can recommend each of them with confidence. So today, we want to outline some of the best clean themes for you to implement for your clients or even your own company or personal websites. 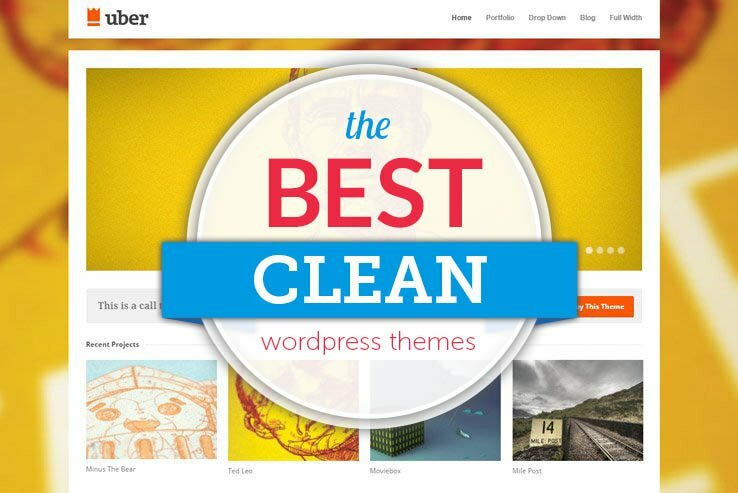 Keep reading to learn more about the top clean themes currently available. 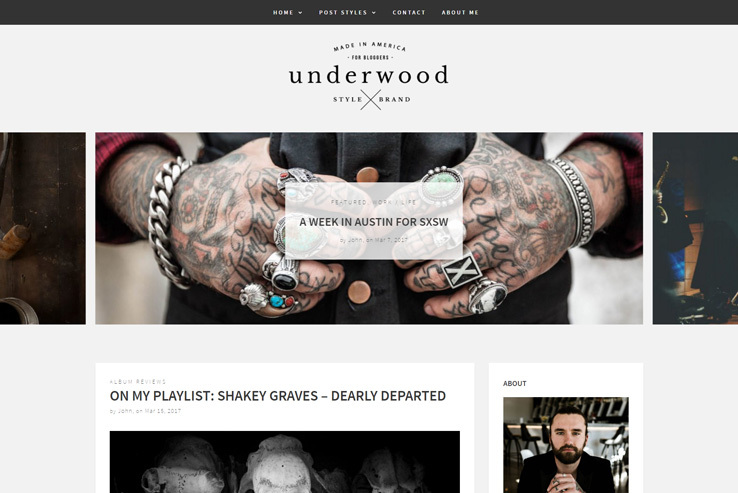 Underwood is a clean and modern WordPress theme ideal for minimal, stylish personal or lifestyle bloggers. Your readers will enjoy their experience thanks to plenty of negative space that puts focus on your content. Since the theme uses clean code and is based on the Bootstrap framework, your site will load fast and look amazing on any device, including smartphones and tablets. This template comes packed with lots of useful features and options, such as 3 frontpage layout styles, 9 custom post formats, a content-driven frontpage slideshow, full-width post banners, custom widgets, and more. 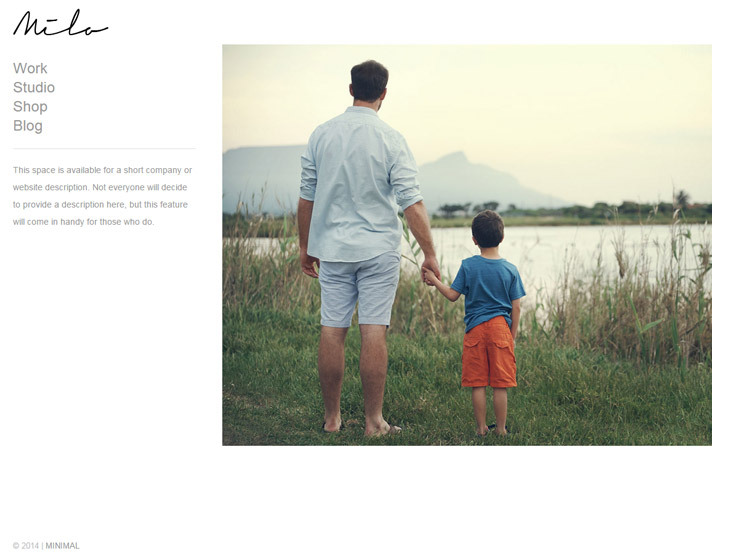 Choose between the standard homepage blog layout or a grid-style layout with or without the sidebar. The frontpage slideshow is great for highlighting your best content while the full-width post banners will add depth to your content. In addition, the Underwood theme allows you easily reach your audience on social media. Social media buttons are included so your visitors can easily follow you and share your content. Moreover, you get an Instagram feed that looks awesome when displayed above the footer or in the sidebar. 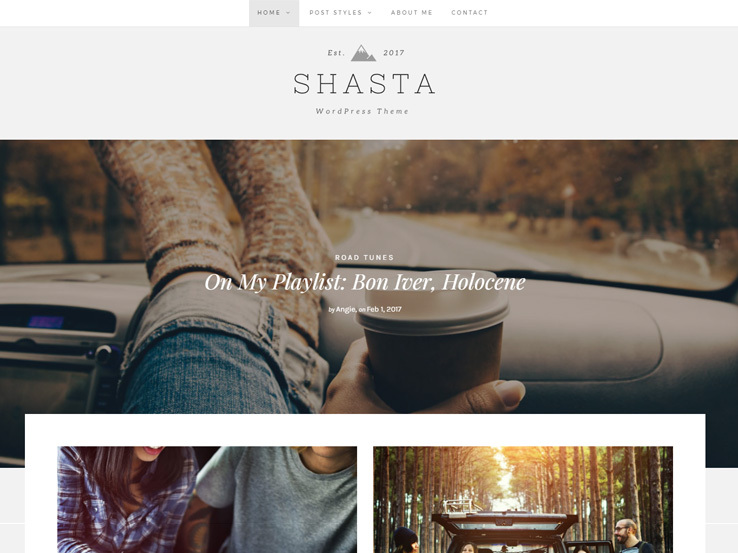 The Shasta WordPress theme offers a clean, well-thought-out design along with neat code that results in faster loading times for your site. The code is optimized for search engines as well, which helps improve your search engine rankings. Despite taking on a minimalist approach, Shasta is packed with premium features and options. The theme comes with 4 frontpage layouts, 9 custom post types, social sharing options, and much more. The frontpage layouts include cascading grid-styles with or without sidebar, as well as a captivating fancy layout. The homepage features a large beautiful full-width banner with a link to your latest blog post. At the top, the large logo is great for branding purposes. Easily create audio and video posts, or build beautiful gallery posts with small or large banners. Furthermore, you get an Instagram feed that looks amazing when displayed above the footer or in the sidebar. The theme supports WooCommerce and other major plugins, like W3 Total Cache and WP SuperCache. Since Shasta works seamlessly with the WordPress customizer, styling your site will be a breeze. Quickly change colors, header images, and other settings with live previews. And if you ever get stuck, refer to the extensive theme documentation or contact the helpful support team. Check out the Simple WordPress theme if you’d like one of the top solutions for a clean website. 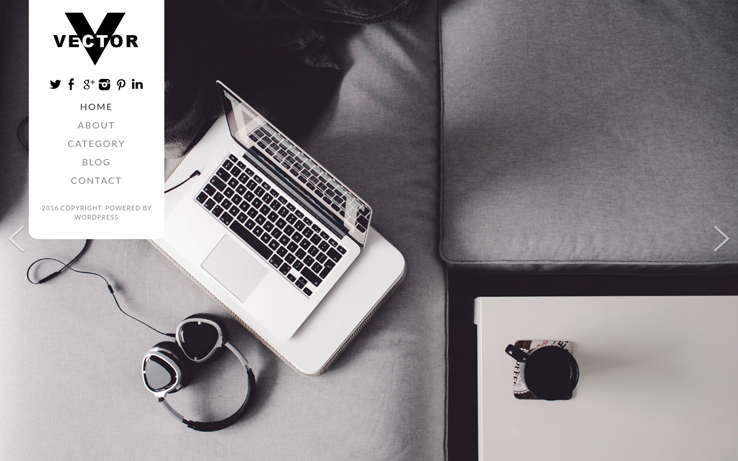 This elegant and easy-to-use theme has all the tools you need if you’re looking for a stunning blogging or business platform. Let’s start by looking at the color variations. One of the most annoying parts about customizing a website is changing little pieces of color, whether they’re located on a button or a header item. Simple theme, however, lets you customize all the colors with a click of a button to create the color scheme that matches your branding. You also get multiple banner and slideshow options because every blogger needs a way to showcase promotions or recent articles. One of the best ways to go about doing this is to use a static banner or slideshow. In fact, many people are known to use the slideshow for sending customers to sales pages, considering you get buttons and overlaying text options. It’s worth mentioning that the mobile layout for the Simple theme looks amazing. Thanks to numerous shortcodes, you can easily create elements such as buttons, columns, accordions, and more. This allows you to insert those elements anywhere on your page without having to know how to code. Finally, if you want to add an online store to your website, Simple theme integrates with WooCommerce so you can easily upload images of your products, add descriptions, and set up payment options to turn your website into a full-fledged eCommerce website. The SixtyOne theme is a wonderful theme for hotels. When staying at a hotel, people want to know that it’s clean, so why not start that mentality with a clean and friendly website? The beautiful and responsive theme works well for all hotels, motels, and lodging facilities, and the flexible homepage layout turns your design process into a fun experience. The booking form makes it easy for potential customers to book a room in your hotel when they visit your website while four content types allow you to add pages for rooms, galleries, sliders, and testimonials. Along with custom widgets, the content types are perfect for changing up the monotony of a standard website. A clean white background is everything you need to keep the focus on your stunning photos. Dorsey offers another clean solution that uses a generous amount of white space. The menu has been moved to the side so your content can take the center stage. Social media icons are perfect for growing your social media audience and Google Fonts bring elegance and style to your typography. Dorsey works best for portfolios since you can create an unlimited amount of galleries while displaying your images as small thumbnails. Although Dorsey theme looks stunning on a standard computer, it also offers a beautiful interface on smaller devices. Quickly add a logo on the backend of the site and use the column shortcodes to insert your own widgets. The whole background color can be swapped out and you can also customize the menu and the fonts. The built-in blog is one of the easiest ways to boost your search engine rankings and accumulate more customers. Create as many images and pages you want and easily set up shop with the help of the WooCommerce plugin. Finally, you can also insert videos since it integrates with sites like Vimeo and YouTube. Milo boasts striking elements for bloggers and businesses since it provides a minimal amount of clutter amplified by white space that covers most of the site. The Milo theme is responsive so even those visitors viewing your website on mobile devices will be able to see your content without problems. You can choose between a large or thumbnail portfolio view and the unlimited portfolio count makes it simple for featuring content you’ve worked on in the past. Upload an unlimited amount of images and create however many pages your business needs. Milo has features that work with WooCommerce for those who would like to sell digital or physical products through your website. YouTube and Vimeo support is offered with the theme while social media icons provide a way to build your social platforms. 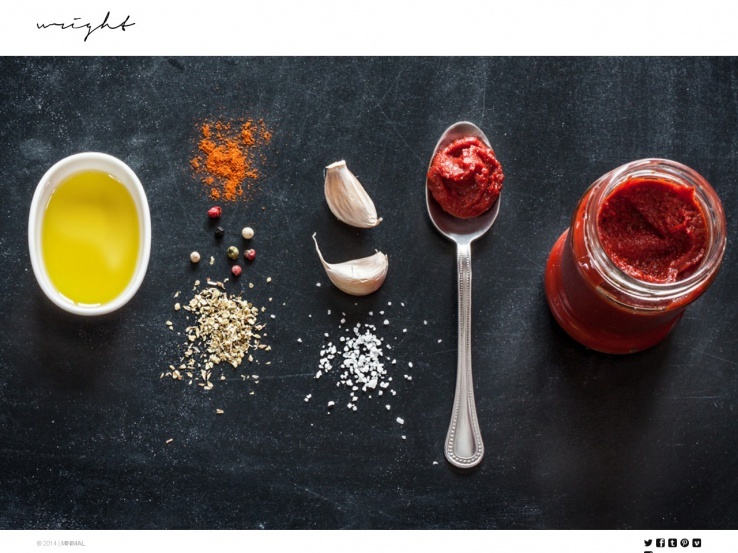 Image captions are great for encouraging your visitors to click through to read your posts. Google Fonts provide an easy way to customize your website; upload your own logo and use column shortcodes to change the layout of your page. The built-in blog boosts SEO and helps you connect with your audience. Not to mention the gallery descriptions and menus that all come together to generate a strong, yet minimalist WordPress theme. 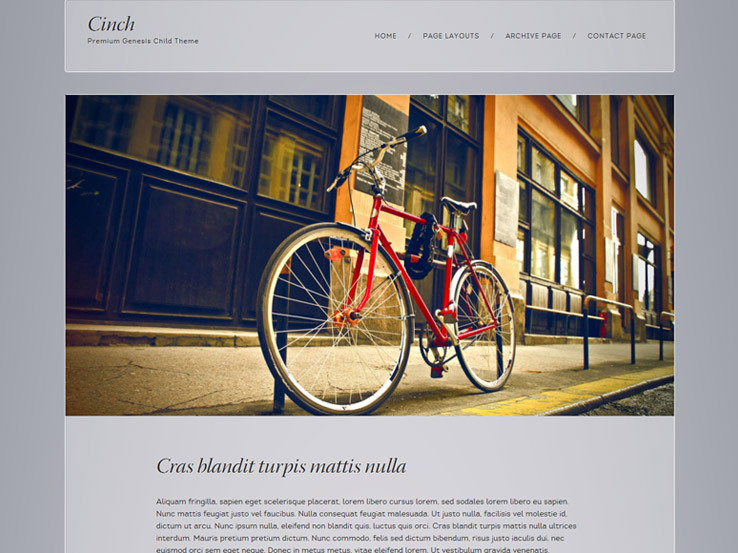 The Cinch theme is designed with modern bloggers in mind, with its powerful features and clean components. In terms of design, the default version comes with a dark gray color scheme and the entire homepage consists of the blogroll and header image. The theme works similarly to a one-page theme since you can implement modules for areas like testimonials, portfolios, and featured videos. The theme works on all mobile devices and it has powerful localization tools, which means that you can translate your website into any other language so that other people from around the world have the ability to hear what you write or post online. Wright provides a fun, clean, and responsive look, which makes it a modern theme. It offers playful text options and the ability to connect with WooCommerce for selling your products to anyone online. The theme also includes lightbox portfolios for the chance to display your best work for potential clients. 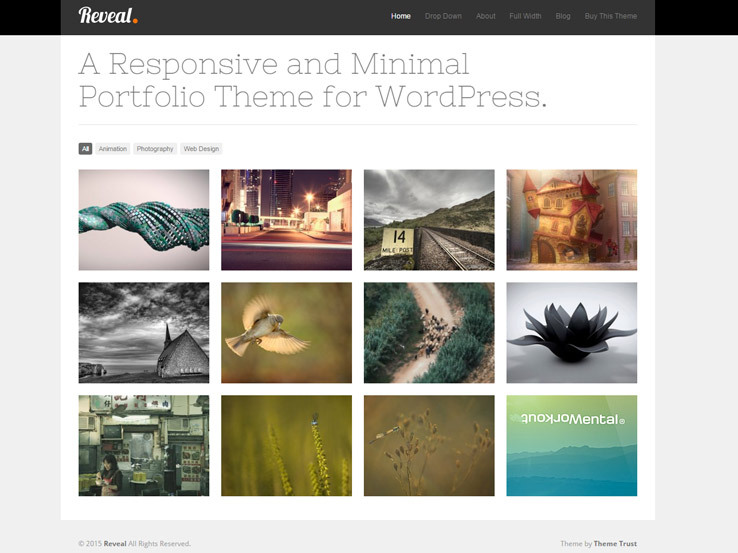 The theme is fairly interesting because you can create unlimited portfolios and pages and upload unlimited images. The media-based theme has YouTube and Vimeo support and the HD social media icons ensure that your customers know where to find you on Facebook and Twitter. The built-in blog helps you boost your search engine rankings. Google Fonts are great to customize the typography and add a touch of style to your website. 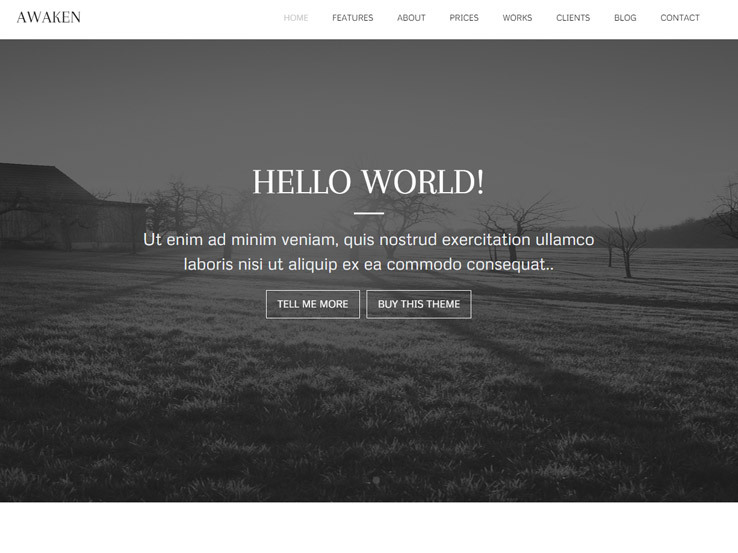 Vector is a responsive WordPress theme with a clean layout. You can use this stylish theme to create an appealing portfolio website, be it a personal portfolio or a website introducing a design agency, an advertising agency, or any other business. The theme would be a good choice for those looking to promote creative works, products, or services online. As for the design, the theme has a fixed menu for easy navigation, a full-page image slider, and a well-structured layout. Also, the Vector theme is mobile ready, SEO-optimized, and is compatible with all major browsers. The price for this theme is quite affordable and it includes lifetime support and updates. Moreover, you can use the Vector theme as many times as you wish because one of its main features is Unlimited Domain Usage. Keep this theme in mind when building an impressive portfolio website. The Divi theme is one of the best on the market and the clean designs and powerful features make it one of the top options on any of these WordPress theme lists. The primary reason people like Divi is because of the way you can build your website. It uses a flexible and smart system called the Divi builder, which allows you to drag and drop your components all over your website. 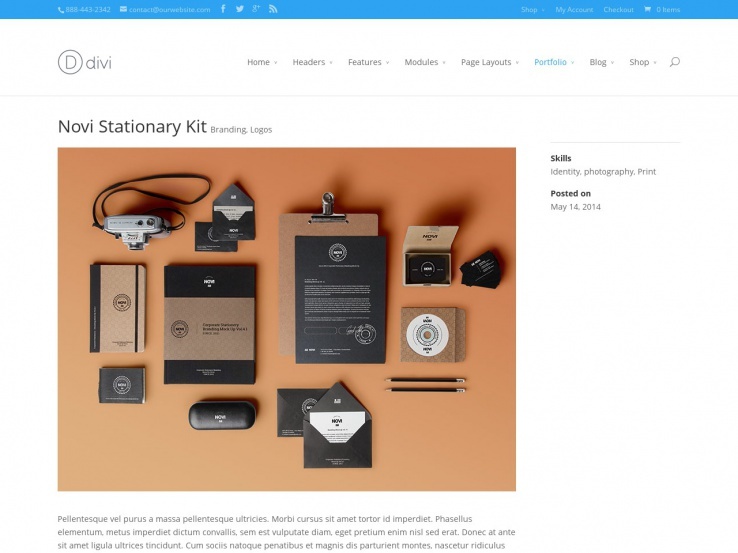 Divi comes with 18 pre-made layouts meaning you rarely have to build one from scratch. We like this for both beginners and advanced users since it cleans up the often messy development and design process. The responsive design looks great no matter which device your visitors are using. The Divi Builder utilizes modules for placing anything from testimonials to contact forms, animated counters to full-width sliders. 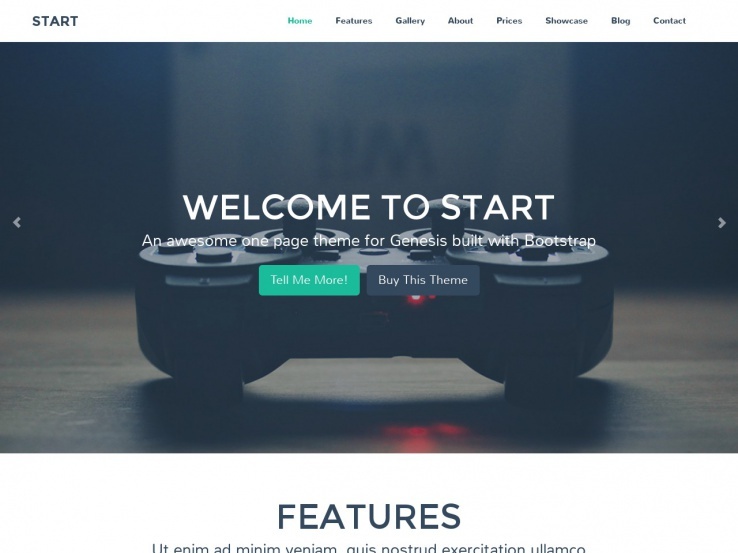 In short, if you need a clean and extremely strong theme, go with Divi. 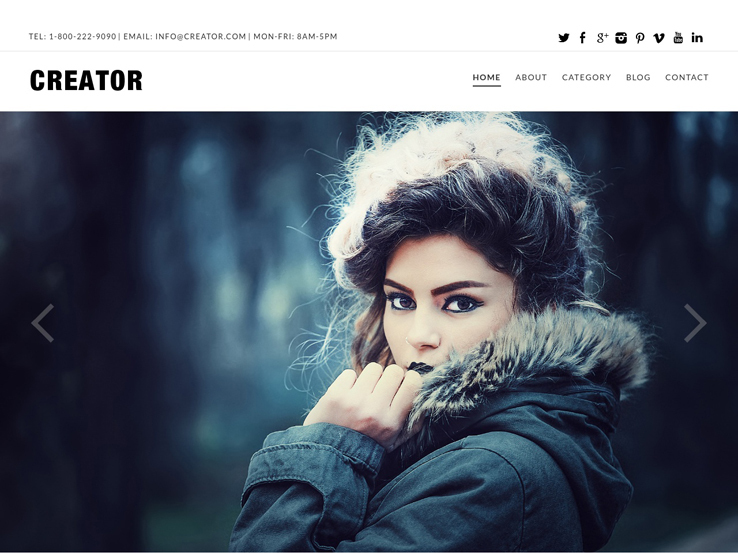 Creator is a responsive WordPress theme with a clean and stylish look. 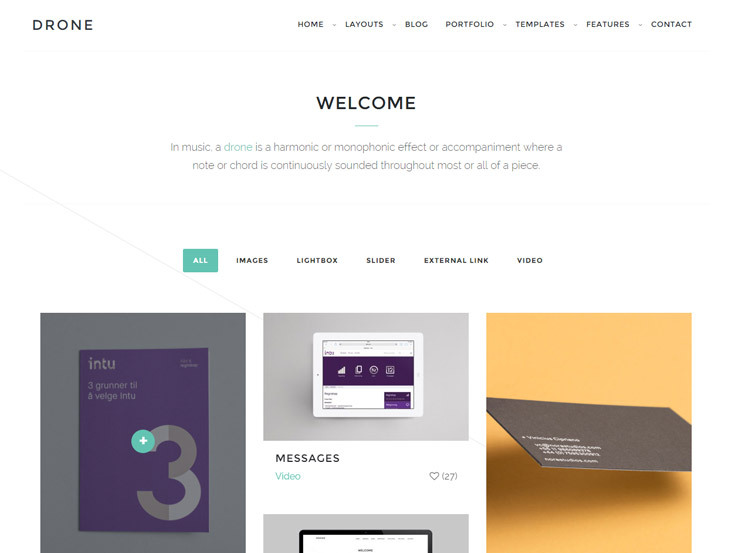 This theme is perfect for web designers, photographers, freelancers, illustrators, and other creative folks. And the good news is that it can be used for both personal and corporate portfolio websites. You will easily notice this once you check out the live demo. The Creator theme has a fixed navigation menu, a responsive image slider, and a grid based layout. As the theme is mobile-friendly, your website will look great on almost any device, be it desktop, laptop, tablet, or smartphone. Also, the theme is (and will always be) compatible with the latest WordPress version because it comes with free updates. And of course, the theme is easy to customize so it won’t take you long to upload your content and launch your portfolio website. In fact, you can buy the Creator theme once and use it as many times as you wish. And if you ever have a question on how to install or edit the theme, you can contact the Dessign.net team and get professional help for free. The Reveal theme comes from the folks at Theme Trust. The theme offers a responsive and clean interface that looks stunning no matter what kind of phone, tablet, or computer your visitors are using. The idea behind this theme is to use the power of Ajax loading and clean components to load your images with ease. Thanks to those features, you don’t have to worry about your site loading slowly. The slideshow shortcode is wonderful for quickly implementing a gallery that shows your best content. The custom widgets and logo upload options mean that you rarely have to deal with coding, and the filterable portfolio allows you to categorize your portfolio pieces for easier navigation. The Drone theme works off the Genesis Framework, meaning you have all the customization options you can ask for. The theme eliminates clutter and provides as much white space as possible. It has a modern design, with an intent for use on blogging sites and portfolios websites. Drone is ready for use on mobile devices, no matter how big or small. The filtering options on the portfolio ensure that none of your potential clients get lost when searching around. Feel free to create a blog on your website and play around with the shortcodes and typography tools for a sleek branding experience. 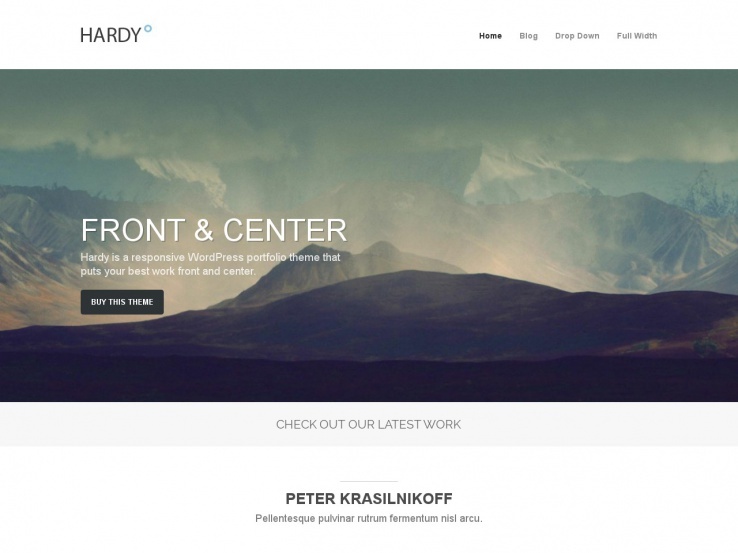 Try out the Hardy theme for a responsive and minimalist experience. The goal for this theme is to present your past projects in the best light, placing them front and center on the homepage. The slideshow shortcode makes it quick and easy to add a stylish slideshow and the logo upload is excellent for establishing your brand identity. Lots of shortcodes are available for making buttons, columns, and other items. Modify the background to make it look the way you want and embed videos from places like YouTube and Vimeo. The theme is interesting because you can almost place all of your content on the homepage and not worry about implementing other menu items. 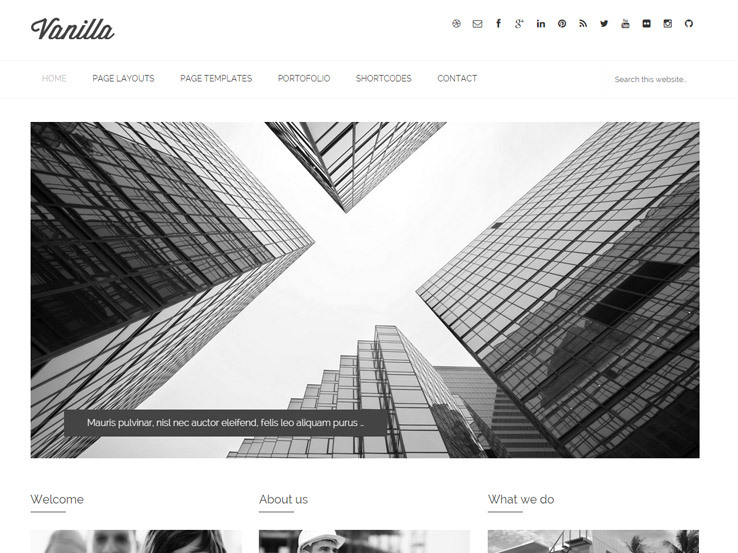 The Vanilla theme is a clean option for an upcoming project or company website. The mainly white theme has a fairly large slider for introducing your customers to products or readers to your latest posts. The slider allows overlaying text, which is a great way to implement a call to action that directs people to your sales pages. Highlight your projects in a portfolio format and segment your items with filterable portfolio tools. Various widgets are available to add additional content. Choose a Flickr widget or share some of your most recent posts. Page templates and layouts are a nice way to add variety to your website and the shortcode options are endless, ranging from buttons to columns, drop caps to pricing tables. 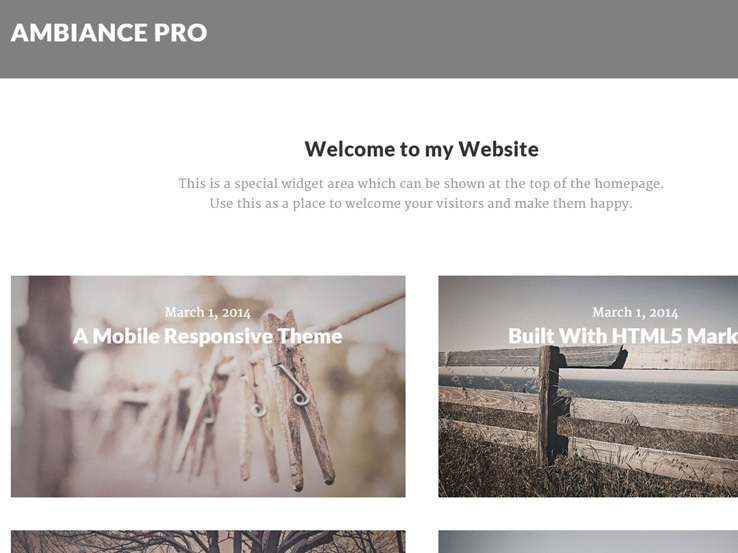 The Ambiance Pro WordPress theme comes from the team at StudioPress so it goes along with the famous Genesis framework. The clean ad-responsive theme is great for anyone who wants to establish a long-lasting relationship with your audience. 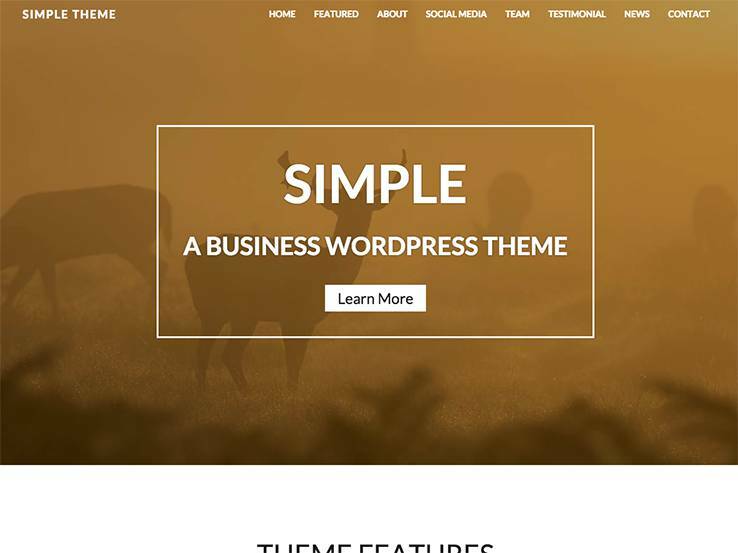 This means that your images, posts, and media elements are all there to immerse your readers in the experience, making this theme an easy addition to our list of the best clean WordPress themes. The white background is fronted by grid style images, which all lead to additional posts and pages. The grid modules make it easy to organize your content and they look even better on mobile devices. Add your social media accounts and change the typography to add some variety to your site. The posts display in a single column layout with a stunning full-width image at the top that lets your readers focus on your content. 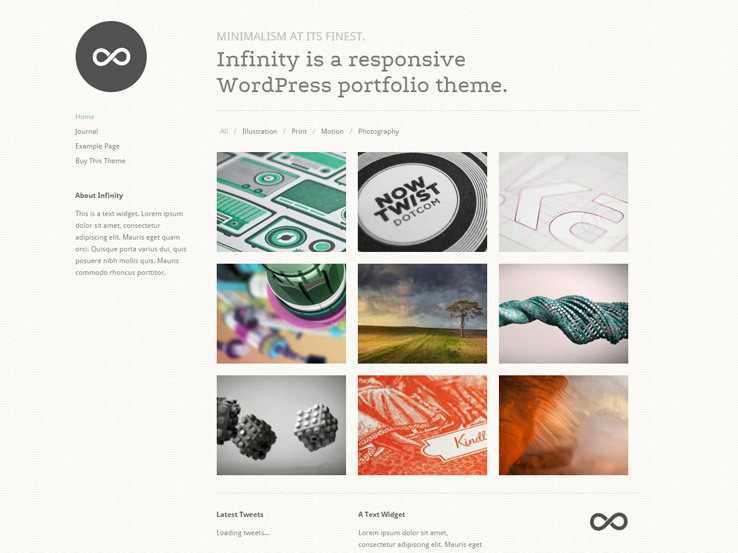 Infinity is a clean and minimal theme designed for blogging and to showcase your work. It includes filters for your projects and features infinite scrolling through all of your blog posts. It has video support to let you embed videos from Youtube, Vimeo, and other similar sites. The responsive layout makes it look great across all devices with several custom widgets and theme options to make your site look exactly how you want it. It contains built-in page templates and backgrounds to help set up your pages quickly. It also contains multiple shortcodes to swiftly and easily create slideshows, multi-column layouts, and place buttons anywhere you want them. Google Web Fonts provide easy access to several font types that won’t slow down your page. It has localization support and is tested to run smoothly in all modern browsers. This is a nice theme for bloggers and business owners of all kinds. 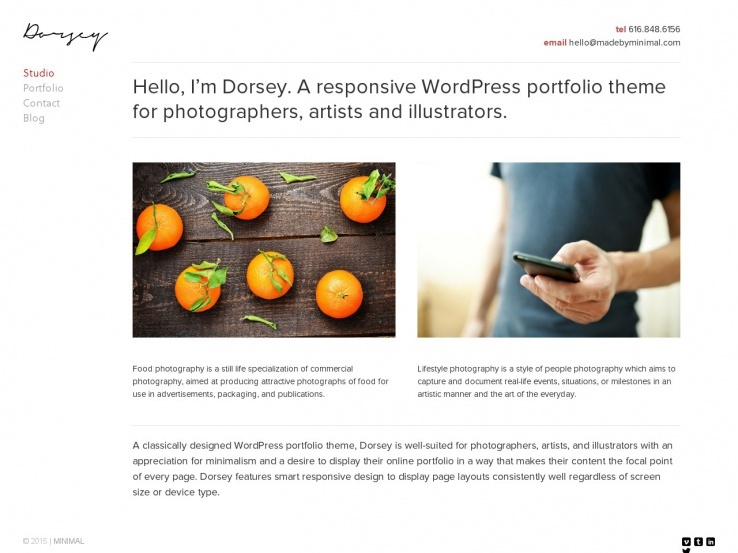 Zoomy is a theme for blogs and portfolios based around professional photography. Its clean, minimalist design makes everything easy to find, and between the responsive design and Retina Ready functionality, it’s sure to look great on any device. It’s run on the Tesla Framework, allowing you to customize both the appearance and function of your site without the need for advanced web design skills. It includes several built-in shortcodes to make creating new elements even easier. It includes several custom posts such as Services, Testimonials, Team Members, and Calendar to help your site look professional; you can customize them if you want. It includes support for social media and video embeds, allowing you to connect all your other platforms directly into your site. A customizable featured slider lets you show off all your most important posts with animated transitions. It comes with custom widgets, posts, and templates that allow further customization to suit your exact needs. Zoomy includes seven layouts to choose from, with filter option to help your visitors find what they’re looking for. It includes a contact form that runs on AJAX, which allows your visitors to send you a message without having to reload the page. Google Maps are built in. If you’re a photographer or running a blog with lots of photos and you want a sleek, stylish theme that works across all browsers and devices, Zoomy is an excellent choice. The Awaken WordPress theme is a great choice for anyone looking for the perfect clean theme that’s also modern. It’s trendy and it provides localization files right out of the box, allowing you to translate your entire website into any other language. Along with that, you gain access to the beautiful responsive theme that looks great even on mobile devices. The header area consists of a stunning slider that allows you to place high-resolution images and include calls to action that lead people to your sales, service, or contact pages. Other than that, the theme works as a one-page design featuring different sections with content for you to play around with. For example, one of them is used as a pricing chart, while another one is great for listing your services with icons and columns. Parallax backgrounds are included throughout the entire homepage and you can place text and buttons on top of these backgrounds. The About Us section is perfect for featuring members of your team. You can upload images, descriptions, and links to personal social media profiles if you want. It’s a wonderful way to add personality to your company while giving your coworkers the credit they deserve. The Awaken theme supports a full portfolio, which looks like a grid-based layout with filters and lots of other cool tools. Easily include testimonials with the click of a button to build trust with potential clients. Along with various other rows for information on the one-page layout, the Awaken theme is a solid choice if you want a clean theme. Here’s an option that combines both a clean design and a one-page layout. This all works to your advantage because it also has a responsive framework that looks great on mobile devices and minimizes the amount of clicking your visitors need to do to get to certain pages. A one-page layout is actually one of the easiest ways to embrace the mobile era, considering it has all of your content on a single page so that users don’t have to keep clicking on menu items that may be too small for them to even see. Along with that, you can take advantage of a beautiful slider area, with overlaying text and buttons. It’s a great way to provide a brief information about your company or to include a call to action to your latest promotion or product. The one-page website is set up with different sections each of which has a different purpose. For example, one of the sections has columns and icons for your services. Another row is a complete gallery with filters. Many companies use this as a portfolio because it provides small thumbnail images, links, and filters for potential clients to find the most relevant work. Show pictures and descriptions of your team members, and link to their social media profiles. Parallax backgrounds are used throughout the homepage, which is nice for grabbing attention and putting call-to-action buttons on top of them. The pricing tables are a solid bonus while the testimonials are sure to convince customers that you are worth working with. Along with a full blog, contact form, and an area to display your most recent blog posts, the Start WordPress theme is a powerful option with a clean design.